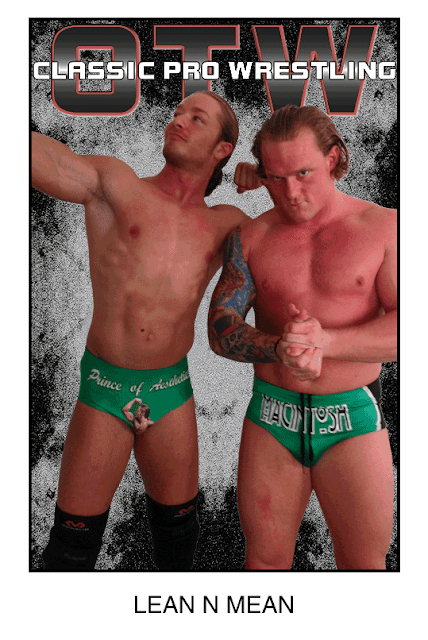 BIO: They very well may be the most prototypical tag team in OTW. They have the look, the talent, aggression, and charisma that every pro wrestler should wish for. The only problem with these two guys is they might be too concerned with their own appearance or unable to contain their aggression properly to climb the ranks of the OTW Tag Division. Damian Gibbs & Matt MacIntosh have everything it takes to mix it up with every wrestler at OTW, and they know it … and they never stop telling anyone who would listen to them about it. Properly dubbed Lean & Mean these two wrestlers are in tip top shape and have the tenacity to succeed anywhere in pro wrestling, now if they could stop telling everyone they are going to do this and put the whole act together then the skys the limit for these two wrestlers.